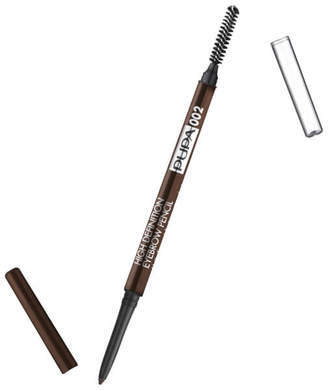 Create enviable arches with the PUPA High Definition Eyebrow Pencil ; a dual-ended tool with an automatic brow pencil and a spoolie brush for combing and taming. Combining innovative film-forming agents with a perfect blend of waxes and pigments, the precision pencil applies effortlessly to deliver waterproof, natural-looking colour with long-lasting results. Create sculpted, expertly defined brows without risk of smudging. Dermatologically tested. Paraben free.